It does no real work in the song, that “a-ha” – it’s an afterthought, another little hooky Easter Egg from a band committed to packing as much as they could into their tracks. No fault of ABBA’s, honestly, that for British listeners of a certain age and background (mine) it dominates the song now, that tiny bridging sigh cueing up a Norfolk bellow in the head – “Knowing me, knowing you – AH-HAAAAA!”. Steve Coogan and Armando Ianucci’s selection of this mini-moment for Alan Partridge’s signature phrase was a stroke of cruel inspiration – too easy to take the Abigail’s Party route and make the monstrous (later tragic) Partridge a fan of, say, Manhattan Transfer: even that would have suggested a curiosity quite beyond Alan P’s galumphing populism. But it was also curiously ill-timed: Knowing Me Knowing You (the radio and TV show) started just before ABBA’s return to critical respectability. The sudden inescapable Partridgeness of this song made it a ghost at the new ABBA feast, a reminder that a corner of the fanbase would always be patterned sweaters and light ent. The bad end of mundane, in other words, but mundane is what ABBA do so well: “Knowing Me Knowing You” is the first of their great wintry epics of boring grown-up heartbreak and the acceptance of heartbreak, trying to cadge a bit of hope out of a hopeless situation, balancing between the numbed verses and the wonderful cascades of backing harmonies from the guys on the chorus. It’s Frida’s star turn – though her first verse performance is a little wobbly – but Agnetha nearly steals it with her spectral whispers. The keyboards hit the grandeur they’re aiming for; the guitar solo doesn’t, but even in its forever-sabotaged state “Knowing Me Knowing You” has cohesion and power. The Arrival album was Abba’s Rubber Soul; a musical and emotional crossroads which could either entice the group back into their old ways – the very silly MoR bubblegum of “When I Kissed The Teacher” and “Dum Dum Diddle” – or lead them into pop’s future; if “Dancing Queen” were the hardest of acts to follow, it should be pointed out that on Arrival it is followed by the breathtakingly beautiful and epic “My Love, My Life,” possibly Agnetha’s finest solo vocal performance – certainly up there with its gruelling sequel, “The Day Before You Came” – surrounded by ectopic strata of those sounds of a heaven which Brian Wilson would have been proud to inhabit. But creating a future for pop might necessitate negating their own future, as people, as couples; “Money Money Money” is Abba’s first really cynical song, and it was appropriately given to the darker, less reassuring voice of Frida. That same voice provides the chill which still possesses the power to shock in “Knowing Me, Knowing You”; the summer paradise of “Dancing Queen” has given way to a blasted heath of autumnal, miles and miles of space in between those echoed electric piano chords, breaths which may be both real and synthesised, and that 1968 phasing which they may have been among the last pop acts to use without irony. Is this the entry of the Devil? Frida sings, with a detached, near inhuman surface tone but rage evident beneath, aggressively isolated groups of two syllables in two triplets – six, six , six – “No more. Care-free. Laugh-ter. Si-lence. E-ver. Af-ter.” This is followed by a more aggrieved, almost hysterical widening of the emotional picture: “Walking through an empty house, tears in my eyes,” and then, “Here is where the story ends. This is goodbye.” The final syllable hangs on to the final chord like a desperate patient clinging their oxygen pump, and the music stops, suddenly and starkly. “Knowing me, knowing you (uh-huh)/There is nothing we can do,” the cold rationalist chorus asserts, already treating this collapsed affair as a post mortem. Male and female voices overlap with yet more ’60s memes (“Breaking up is never easy I know”) but the conclusion is irrevocable, “But I have to go. Knowing me, knowing you, it’s the best I can do,” sung in a manner which dares you to consider what the worse options might have been. In the second verse Frida the singer and Frida the thinker wrestle with their recollections of this love (“Good days” drifts into “Bad days” like a conscience warding off the Romanticist), and again the days of 1968 pop melodrama are recalled (“In these old familiar rooms/Children would play”) – but this is the kind of lyric, and indeed the type of song, which only could have been a product of the disappointed, emotionally and physically bereaved ’70s (think back to Carly Simon’s “That’s The Way I’ve Always Heard It Should Be” from 1971, already so cynical about and wary of any future, and view this as the final part of a trilogy, the second part being either “You’re So Vain” or “S.O.S.”). Again, in rather pallid company – this is the first 1977 number one to be set above ballad tempo, if only just – the invention and stark candour of Abba’s records put everything else around them to shame. But there is still that reluctant looking back over the shoulder of early ’70s rock; the guitar line following the chorus could have been taken from “January,” and I wonder whether such an artfully constructed song might have done better to have no guitars at all. Their next number one would solve that dilemma rather magically. “When I Kissed The Teacher” is terrific and unusual – the only ‘teenage’ ABBA song, and surely very 76/77 in its gleeful awakening to the potential of playing with authority. Not even Steve Coogan can sully my enjoyment of this. ‘Knowing Me Knowing You”s genius is that, to me at least, it’s always sounded so euphoric, a strangely triumphant break-up record. By this stage Abba really were our generation’s version of the Beatles, in that they towered imperiously above all the competition, every single would sound different but still indisputably themselves; and everyone, from my 7 year old self to my 47 year old pop-phobic mother liked them. Their brilliance was the one thing we could agree upon. With this song, Abba became as good as their fans said they were. More Scandy glory and another monster. It remains astonishing that this foreign outfit was able to consistently produce such finery on a conveyer belt, rarely, if ever, bombing. KMKY was just such a dammed good pop song, verse, hook, chorus, wallop! Game over. Back in the day, I, like so many of my fellows, had been gripped by the advent of punk, although safety pins, gobbing and behaving like a dickhead were never really for me and I couldn’t even have faked it with my head in a book all the time. But even fake punk Waldo had to acknowledge the merits of those wonderful Swedey popsters. And there were always the girls! Though I know that ‘Dancing Queen’ is technically Abba’s greatest achievement (not in the cold sense) this is my actual favourite record of theirs. The way Frida and Agnetha’s voices come at you on the chorus always made me think it was a very angry, bitter and pissed-off record, and the icy production gives it a really bleak edge. All that Kierkegaard and Bergman probably. I agree with the assembled praise. After my wobble over Dancing Queen I find myself back at the celebration with this magnificent single. The melody and the arrangement dances on a knife edge: does it sound celebratory and upbeat? Or is this the high drama of emotions frayed at the edges? The repeated ‘uh-huh’ saeems to me both impatient and resigned: we both know this is over but only I am admitting it so come on, come on, do I have to be the one who ends it? And when the horrible thought is put into words (‘this time we’re through’ ‘I have to go’) the arrangement goes into double time, the backing vocals cascade with agitation, as if to mimic the adrenalin, the heart pounding through the emotion. For a song of such pure pop sensibility, it’s a remarkably truthful record. I still don’t get the Abba-worship thing. Making Partridge a MT fan wouldn’t work because they would be far too sophisticated for him. But making him an Abba fan doesn’t really do Abba any favours. If you’d asked me before we reached the days of Abba I’d have been ready to woman the barricades against the coming onslaught for the populists, but I’m a tad disappointed to find that, while there’s undoubtedly an onslaught, it’s a small one and looks a bit petty from here. In the absence of a “very well then, alone!” battle, I feel bereft of anything new to say about this latest episode in the Saga, beyond that it’s the thoroughly well-put-together and enjoyable piece of undemanding yet stimulating pop that we’d already come to expect from them. And that was always Abba’s problem, as it was once for the Beatles. By coincidence, I was listening to this song the other day, and cursing Steve Coogan for associating it with Alan Partridge. That link aside, the song is masterpiece, managing to combine an operatic level of tragedy with the three minute pop song format. Just on the “Arrival” album, what do people think about Abba albums? There is a part of me that would love to explore the more esoteric treasures that never made it as singles, but I have picked up the idea that apart from the singles, Abba albums are all filler. In some ways, its harder to find something useful and interesting to say about records that you find to be emotionally devastating and brilliantly arranged than finding something amusing to point out about fluff like Chanson D’Amour, but… Here’s something that no-one has pointed out yet. Have there ever been songwriters with such an amazing sense of specific humdrum place as ABBA? Once you start noticing it, its all over their work; The empty home here, the confetti on the floor of Happy New Year, the lonely bed and the ceiling in One Of Us, the breakfast table that the daughter leaves in Slipping Through My Fingers… leading on to the terrible blank conclusion of the room where the angel takes Frida away, and the rain on the ceiling that signifies complete emptiness in The Day Before You Came. In their quiet, grown-up way these people created an – entirely credible – tangible imaginative world for their troubled characters to inhabit. ABBA really were just about the best pop thing ever. ‘I Am The City’ the sole song from the abortive comeback attempt, as featured on ‘More ABBA Gold’, takes this idea to its logical conclusion where the sense of individual character is subsumed into identification with a city. DV: The Visitors, Arrival and Super Trouper have a lot of good non-singles and are as well worth hearing as anyone else’s albums (probably in that order). Voulez-Vous is consistent but consistently a bit sub-par (by their standards) – some people love it though so worth a listen. Ring Ring I’ve never heard. Waterloo has got the AMAZING “King Kong Song” and lots of other good stuff – it’s silly Euro-bubblegum all the way through, very good if you like that end of their work. ABBA: The Album I find a bit of a chore, singles aside – I’m sure there’s at least one amazing track on it though, just can’t think of what. They also tended to have good B-Sides, most of which are collected on the early-00s CD reissues, so that’s another reason to get them. Once you’re on the rarities trail try and find mournful fragment “Just Like That” and the deliciously spiky “You Owe Me One”. DV: There are some absolutely brilliant overlooked Abba album tracks that, had they been released as singles, would have easily sat in the public affections as much as several singles. Voulez Vous has a great proliferation of strong album tracks. If It Wasn’t For The Nights and Kisses Of Fire would have been better singles choices than Does Your Mother Know (although there’s a great unreleased song called Dream World that contains bits from the latter two). Soldiers and The Piper are two of the maddest songs they wrote. Imagine a procession of Nazi oompah-loompahs marching cheerfully into a sulphurous sunset whilst banging on tin drums and you get the picture. Also an early gem which served indication of what they had yet to fully turn into was My Mama Said. A sumptuous slice of glacial Nordic soul with a double-yolker chorus. Incidentally, I feel that we’re due a reappraisal of absurd yet strangely melancholy Europop duo Modern Talking, if only for their deployment of peachy double-yolker choruses (ie. one chorus, immediately followed by another) on tunes such as Brother Louie, You Can Win If You Want and You’re My Heart, You’re My Soul. Either that or I need to go to bed. Maybe I’ll go to bed. Once you’re done with the good Abba b-sides, try their shocking folk medley (possibly on the b-side of Summer Night City, but not sure) Pick A Bale Of Cotton has to be heard to be believed. On a completely different Abba tangent altogether, Mark Eitzel does a fantastic version of The Winner Takes It All – but, alas, it only exists in my head. Especially on the “But tell me does he kiss…” bit. Tom, re:17. I guess it must be ‘Eagle’ (a vast, soaring, thing) that you’re thinking of as being the stand-out track on ABBA: The Album. Though I also really enjoy the loopy ‘I’m A Marionette’. Oh! I thought Eagle was on Arrival for some reason. I like I’m A Marionette too, and the other Girl With The Golden Hair songs. So I’m being unjust to it obviously! Number 2 Watch: 3 weeks of ‘Going In With My Eyes Open’ by David Soul (never heard that), followed by 2 weeks of ‘Red Light Spells Danger’ by Billy Ocean. Or “Going In With My Flies Open” as we used to call it. #23 ‘Knowing Me Knowing You’ held off ‘Red Light Spells Danger’?? Truly, bliss it was in that dawn to be alive, but to be watching the charts was very heaven. They do this best – sombre verses and uplifting choruses. One reason I never liked Dancing Queen. Knowing Me is near their best and certainly brought me back on board (albeit temporarily). The uh-huhs are the worst part though and Coogan was right to lampoon them. I find with almost all ABBA records the element of Euro cheeze is never too far below the surface and so it is with this one (also in the multitracked guitar interludes). Having said that the verses are so good I can easily forgive them. Icily compelling. A decent 7 from me. #20 Yes the b-side of the splendid SNC is indeed the horrendous folk medley and goes a long way to undo some of the good made by the a-side. “Going In With My Eyes Open,” incidentally, was the second of the three singles to debut within the top five in the second half of the seventies, and like “Somebody To Love,” failed to reach number one. The harmonies on the chorus blow my mind. This is the “look-past-shoulder and ZOOM and 90-degree-head-turn and PAUSE” one, isn’t it? I love that video, but I lump this song together with the other first four tracks of ABBA Gold in the ‘songs I never need to hear again’ category. Nothing to do with Partridge (that one passed me by) – but compared to other overfamiliar ABBA tunes there are fewer interesting sonic flourishes (like Dancing Queen’s heart-rending wedding bell chimes), and it plods along without the bounding puppydog energy of, say, Waterloo. I looked down on ABBA a bit until this song, which knocked me out. It knocked Elvis Costello out too. I saw him do a terrific version of it on the Wheel of Fortune residency at (I think) the Dominion in London, and he played it at the famous Glastonbury (89?) show where he did an acoustic set then suddenly produced the Attractions for a 45 minute encore. So Steve Coogan couldn’t put me off either. Actually, I like Steve Coogan, we’re going to see him in October. If pressed to name my favourite ABBA song, I will say it’s this one. Fortunately, I’m old enough to remember its topping the charts reasonably well – and the Partridge usage hasn’t really affected my original affection for the song. And I would quibble slightly with Tom’s suggestion that the ‘a-ha’ isn’t doing much work in the song. When singing along to this in the car back in the day, it was certainly the part of the hook I would emphasise. Have we mentioned the video yet? I couldn’t see much above on a quick skim (although I’m sure MC has commented on it on FT in another context). It’s arguably even more iconic than the song. re Billy at comment 15, I think there are better examples. George Jones’s A Good Year For The Roses features, among other lines, the narrator noticing “the sight of lipstick on the cigarettes there in the ashtray” and “a lip-print on a half-filled cup of coffee that you poured and didn’t drink” after his wife walks out on him. I’ve noticed that sleeve looks quite unseasonal for an April chart hit. Is it just intended to signify their Swedishness (snow!) or did it have some kind of Christmas connection ? The “Uh-huh’s” remind me of the responses from the lead singer’s friends during the spoken intro to the Shangri-La’s “Leader of the Pack.” For that reason, this record seems like an adult’s version of the operatic teen Death Rock songs of the early 1960s, with the “death” in question here being a marriage (or two). What the early 1960s New Yorkers and the late 1970s Swedes share is a love of finely detailed Pop as a vehicle for grand passion. British TV culture has in fact produced two Alan Partridges; the broadcaster whose story should maybe have ended in Norfolk (since the last series when everything works out for him is awful) and the Brookside character of the early-mid eighties, last viewed staggering around Brookside Close and howling at the moon like a Scouse Lear. as with all the later, sadder abba (and as others have said) it’s the matter of factness that gets you. in most pop music heartbreak is a terrible breach in the natural order of things, a unique cataclysm that leaves the singer leer (scouse or otherwise) on the moors*. and who hasn’t felt like this? but here – “breaking up is never easy i know” – heartbreak is just another one of things, it’s not nice but it’s happened before and it’ll happen again, each time you die a little inside but what’s left of you will pick up and carry on before. it’s the same stoicism as dancing queen, the absent narrator is yearning for what she’s lost, and for what the dancing queen will lose before she even knows she has it but that’s just life and no reason not to dig the dancing queen. it helps of course that the resignation and regret are wrapped up in some of the most sumptuous music ever made. Unlike other commentators, I actually think the aching guitar break adds to the song, contributing that note of pathos that the lyrics eschew, as does Frida’s slightly unsteady vocal as she enunciates the heartbreaking lines. The picture sleeve strikes me as incredibly ironic–all that cheerful togetherness even as this song hints at what was already going on within the group. 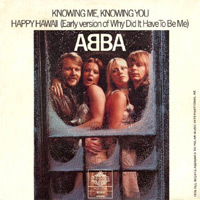 That “Knowing Me, Knowing You” was, in some sense, the beginning of the end for ABBA has always added to the sorrow (mixed with empathy and appreciation) that I feel whenever I hear it. This was a stately rather than lively piece of work, wintry in tone as well as its video (quite surprising to recall that it was number one in springtime). Not one of my very favourites, but as usual chock-full of quality moments – the boys’ backing vocal “this time I know…” particularly effective. I think it was this backing line that French and Saunders had in mind with their glorious spoof “C’est La Vie” (“c’est good for you, c’est bad for me – quite definitely”). Reading the thread I’ve been struck by how much it reminds me of the day in May last year when I left my Mum’s house for the last time, having cleared it after her funeral. Walking through the empty house… etc. Obviously the setting was different from the theme of the song, but much of the lyric still applies. It was her widowhood bungalow rather than the house I grew up in, but children – mine – had still played in the old familiar rooms. In those moments before closing the door I thought – it might be a cliché to think of spectral voices at a time like this, but they do echo in your head, which is why it’s a cliché. I don’t know when I got into the habit of capitalising them! My rationale is that the name’s basically an acronym anyway, so I’d no more write Abba than I would Epmd. But deep down I know that if my keyboard had a reverse-B I’d be using that too. Totally understand the irrational annoyance though – my personal bugbear is the nickname “The ‘Mats” for The Replacements, who I’ve never even HEARD (partly because of this). Oh! The Placemats were my fantasy primitivist/DIY/post-punk/art-rock band, inspired by Devo/Pere Ubu/The Residents/Desperate Bicycles, whose limited edition cassette release Rowing Across The Chesterfield Canal With The Placemats (Boots own brand, 1978) was a ground-breaking classic of the genre. Oh yes. wwolfe@34 – I liked the idea of KNKY as an adult update of 60s operatic teen death rock. The missing link, here, would be the Shangri-Las ‘Out in the streets’, a personal favourite because its about, precisely, that transition: what happens to the leader of the pack when he doesn’t crash the bike, but grows up and settles down? “He don’t / hang around / with the gang no more / He don’t do the wild things that he did before… it makes me so sad / cos I know that he did it for me”. A recipe for 30-something divorce rock if I ever heard one. And now you’ve made the connection everything about ‘out in the streets’ – its doomy measured pace, the two-words-at-a-time start to each verse, the interplay between lead and backing vocals, could be proto-Abba. There is an inner bleakness in this study of domestic upheaval. It’s been covered a lot on this thread, but I happen to notice listening to the guitars especially, that here is a pre-cursor to what messrs Morrisey and Marr were going to perfect 7 years hence. The guitar interludes here are a joy to behold, a glam-pop thrill-ride, that provides balance to the devastation of Frida’s walk through a broken home. Not really Morrissey territory, but if his wry take on teen alienation and boredom is half a generation away from ABBA’s adult marital breakdown and existential crisis, then you could imagine an older Morrissey tackling those themes also. @46,thefatgit. I think you may be on to something. For example, ‘Back to the old House’ does brush wings both melodically and lyrically with KMKY at some points, albeit, as you say with an alienated teen focus rather than a couple-centric one. Judging from Morrissey on Desert Island Discs last weekend, for better or worse, there’s no sign of age shifting his initial focus! Now I think about it too, Abba and the Smiths are fused for me in my imagination as bands that *might* conceivably get together again some time, and that might still produce something shockingly good if they did. Oh, and just reading through the comments now, no one has mentioned this wonderful song’s brilliant bass-line. It’s definitely up there in my view, with the bass-line in Michael Jackson’s ‘Rock with you’ as doing the seemingly impossible: be incredibly driving and also very melodic, and yet be so bedded into the song’s structure and played *so* in-the-pocket that you almost can’t hear it most of the time. Bingo. Yes. That’s exactly how it felt, and what continues to impress all these years later. @47 Although it seems unlikely right now, you wouldn’t rush to rule out a reunion of The Smiths in future. Obviously, there would have to be changes of attitude on both sides. Johnny seems quite content to work with The Cribs, and Morrissey seems to be content as Dame Edna for now. But who knows…if The Gang of Four and The Police can do it, so can The Smiths. ABBA is for me, as close to pure pop as you can get. And it certainly ages well. #15: the breakfast table makes another appearance in One Man One Woman, another album track which had the quality to be a single. Another Partridge/Abba connection: his son, mentioned but never seen, was named Fernando. I can imagine Alan thinking of himself as tremendously sophisticated and continental to have chosen the name. This might just be my favourite of Abba’s number ones. It seems to consist of short, apparently throwaway words and phrases, but the group alchemise them into a wall of emotion. The very best bit of the song for me comes just after ‘children would play’. I disagree with Tom that the first verse is the weak link to this song. Rather than ‘nearly losing it’ for me that opener is the finest vocal of Frida’s career. It’s so dark and brooding. It’s almost as if she’s channeling Nico. In case anyone’s interested, I’ve put a mid-’90s, indie (Revolver-esque) cover of ‘My Love, My Life’ – one of Arrival’s less-heralded tracks – up on youtube here. It’s by a short-lived, long-forgotten NZ outfit, Bike (half of the often excellent Straightjacket Fits if that means anything to you), and it was (in my view) the standout track on a very patchy Flying Nun Abba tribute album. The visuals are from the (Inception-influencing, ingenious) 2006 anime Paprika. re 34 & 45 – I think you’re right to make the connection between KMKY and Shangri-Las – but listening to the song again during the recent string of repeats of TOTP from this time I started hearing the Uh-Huh? as a passive-aggressive response from the male participant in the relationship. While the woman laments the end of the relationship the man has already written it off but is happy for her to take the blame for ending it.